Ray Elgaard is a Financial Consultant with LPL Financial (LPL) in Las Vegas Nevada. Ray Elgaard is a Canadian citizen who came to the US on an athletic college scholarship. 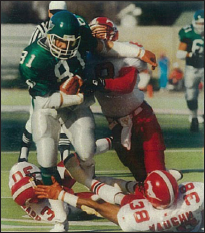 He returned to Canada in 1983 to begin a fourteen year professional football career in the CFL and first became a financial consultant in Canada in 1992. Ray retired from the CFL in 1996 and relocated to Las Vegas and immediately entered the US financial industry. Ray is Series 7, 31 & 63 licensed through LPL Financial, and is also Life and Variable Insurance licensed. As well, Ray is an inducted member of the Canadian Football League Hall of Fame and the Saskatchewan Roughriders Plaza of Honor. Through LPL Financial, Ray is able to provide his clients with an extensive array of high quality products and services, including financial planning, cash management, investment vehicles, insurance and estate planning services. LPL is a national, independent broker/dealer that is a Registered Investment Advisor (RIA) and a member of FINRA and SIPC. LPL was formed in 1989 and as of 12/31/2011, manages over $400 billion in brokerage and advisory assets through over 12,000 Financial Advisors, and has over 2700 administrative staff working in headquarters in San Diego, Boston and Charlotte. LPL currently is the #1 rated independent broker/dealer in the country as based on total revenues as reported by Financial Planning Magazine from 1996-2011. LPL is world renowned and recognized most for its dominance of the independent broker/dealer marketplace. This entity serves the financial needs of Canadian citizen professional athletes who play their sport in the US. This entity serves the financial needs of American citizen professional athlete clients.